McCormick Asian Style Spiced Sea Salt is a Natural Sea Salt combined with an Asian range of spices that include garlic, ginger, and sesame seed. • Just before grilling, toss vegetable chunks in vegetable oil, shake on McCormick Asian Style Spiced Sea Salt and toss to mix. • McCormick Asian Style Spiced Sea Salt is great as a shake-on at the table or when broiling, baking or stir-frying. 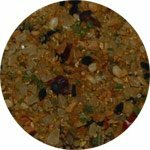 • Asian Style Spiced Sea Salt Makes an ideal enhancement to more delicate meats, fish, poultry and eggs. • For a quick side dish, toss McCormick Asian Style Spiced Sea Salt with pasta and olive oil. • Use McCormick Asian Style Spiced Sea Salt to make a great marinade by combining with water and olive oil. Contains about 368 1/4 tsp servings. Ingredients: Ingredients: Sea Salt, Garlic, Sesame Seed, Sugar, Orange Peel, Ginger, Coconut, Red Bell Pepper, Onion, Soy Sauce (Wheat, Soybeans, Salt), Maltodextrin, Salt, Sesame Oil, Dextrose, Natural Flavor, and Extractives of Paprika. Allergy Information: Contains Wheat and Soy.